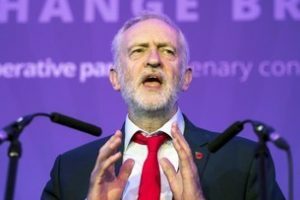 With the Tories in increasing disarray and Labour leading in the polls, Jeremy Corbyn hammered home his party’s advantage at the Cooperative Party’s 100th anniversary conference. Corbyn wryly welcomed chancellor Philip Hammond’s warning that Labour poses an “existential challenge to our economic model”. And with justifiable amusement Corbyn noted the International Monetary Fund’s unprecedented agreement with shadow chancellor John McDonnell that “inequality and low taxes for the richest are harming the economy”. Corbyn took the opportunity to call for workers’ control of robots in the workplace. But what expectations are being built up, and what are Corbyn’s team preparing for? What is the Tory economic model, and what is Labour’s alternative? How will it fare in the context of a desperately fragile global capitalist economy drifting on a grotesquely distended, increasingly volatile balloon of unserviceable debt? What prospects do the Labour leaders hold out for the steelworkers whose Indian employers Tata, having decimated pensions, are now merging with the German ThyssenKrupp and are already threatening once again to close Port Talbot? How would they, for example, deal with the plight of the Canadian-owned Bombardier aircraft workers in Northern Ireland caught in a tariff war between Trump’s US and Trudeau’s Canada – each protecting different corporate interests? The alternatives they examined include: cooperative, municipal and locally-led, and national or state ownership – with measures to improve democratic accountability. The study, by a group of academics and councillors, looks backwards and sideways, but omits any real creative, let alone Utopian thinking. In more than 26,000 words, the document avoids the use of the term capitalism, which weakens the arguments considerably. Nevertheless, alongside a string of promised reforms to the way the economy operates, some of Labour’s proposals are finding their way, tentatively, into conference speeches – much to the consternation of the capitalist commentariat. Hammond and Theresa May have been forced to defend the alleged virtues of the free-market, capitalist economy, which shows how fragile the system is. Condemnation of the private sector and support for public ownership is now coming from unlikely circles, including the former city editor of The Times and Evening Standard! Corbyn and McDonnell’s seemingly dramatic claim to introduce measures to double the size of the cooperative economy is welcome. But what does it amount to, really? Around 0.7% of jobs are in workers’ cooperatives. 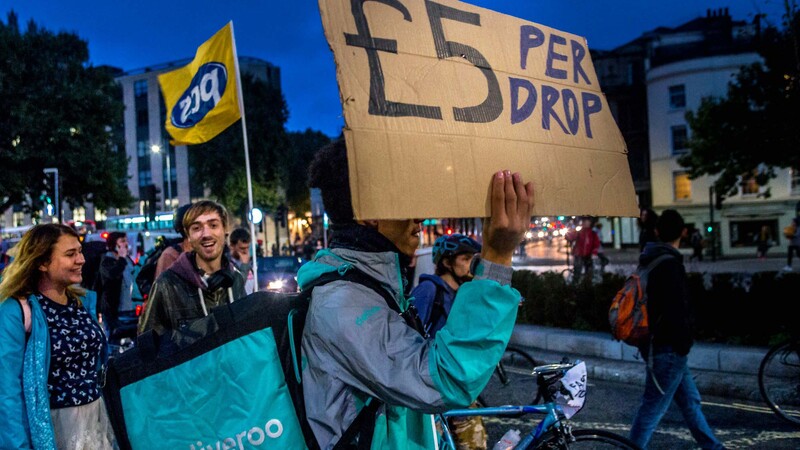 Doubling that to 1.4% with Corbyn’s dream of a cooperatively run Uber won’t make much of an impression on the 14% or 15% – seven million – in the touch-and-go, precarious, twilight world of the gig economy where incomes have dropped by as much as 50% in the last few years. Taking the Royal Mail back into public ownership is obviously to be supported. But what do they propose to do about the myriad ranks of courier companies who’ve leapt into the privatised market, driving wages and conditions nto the ground for both their drivers and for Royal Mail workers? What should we do about major transnational corporations like Amazon, Facebook and Google who have our data and more under their ownership and control? The case for their public ownership has already been set out. The challenges ahead for a Corbyn-led government don’t stop there. In his conference speech last month, McDonnell warned that “our financial services” must “understand that 2008 must never happen again. We will not tolerate a return to the casino economy that contributed to that crash”. 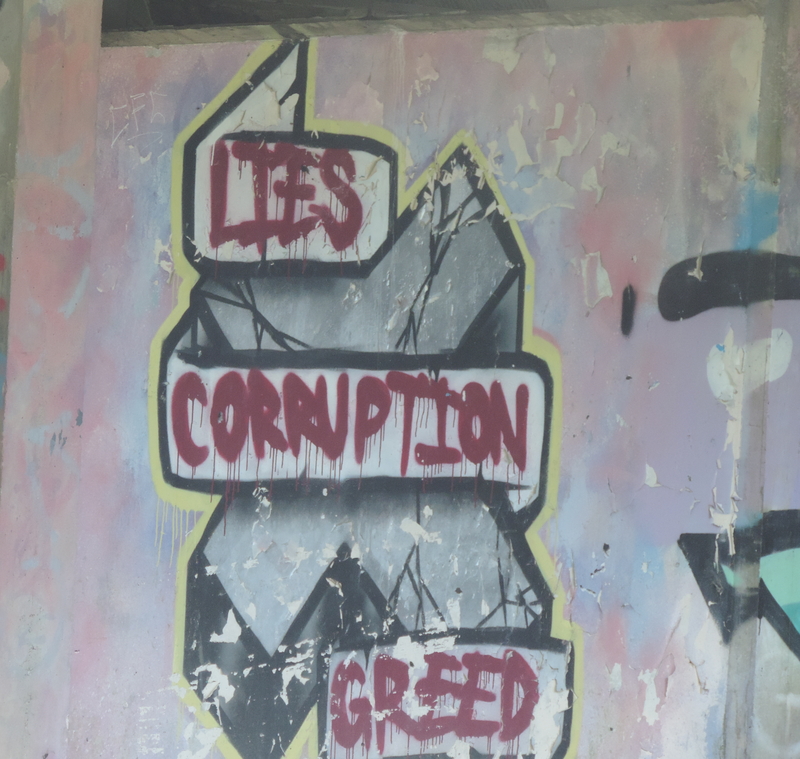 The question is: how do you exert any influence let alone control over a globalised industry of transnational banks and finance houses, hedge funds, investment funds, lobby firms and groups? These privately-owned, profit-driven sectors are beyond nation-state control, operating as they do across borders. The discredited financial instruments like credit default swaps that lay behind the 2008 crash have, by all accounts, been replaced by just-as-deadly exotic arrangements. 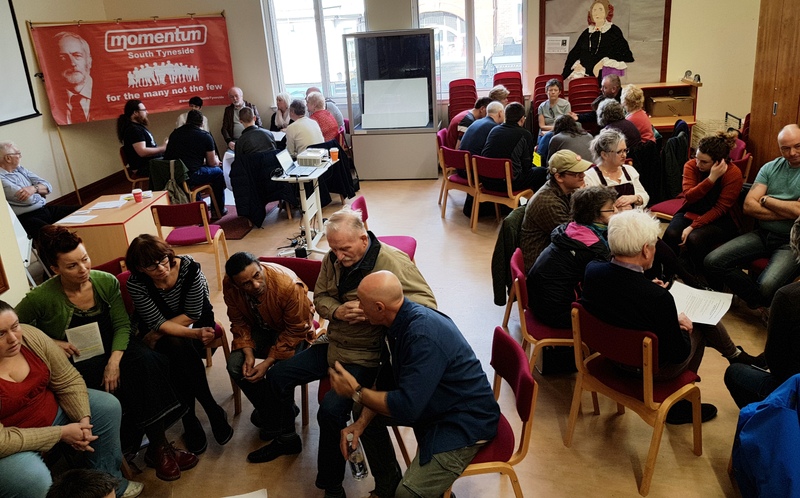 Cooperative ownership and control of the financial sector will inevitably be posed if Labour is serious about changing the shape – if not the nature – of what Corbyn told the Cooperative conference was “a more rapacious and exploitative form of capitalism”. 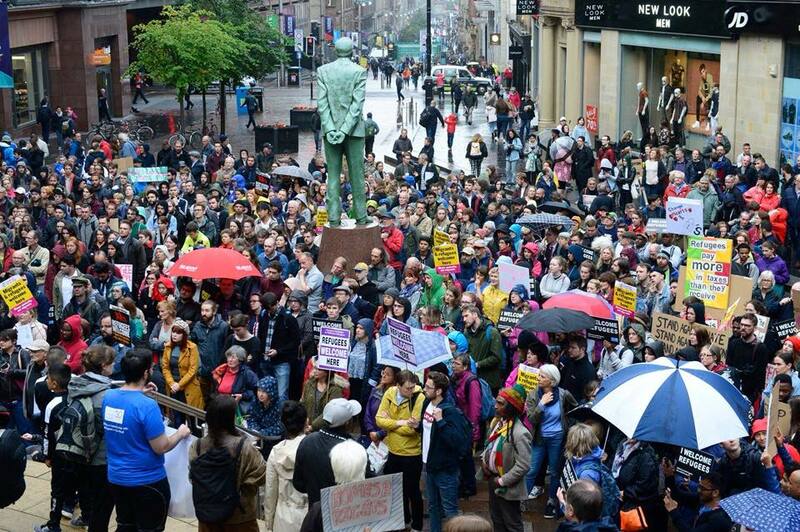 On Saturday, October 28, supporters of the Real Democracy Movement are holding a planning day to discuss the challenges that a Corbyn-led government would face as well as the state attacks that would undoubtedly be mounted against it by a system in deep crisis. If you’re interested in coming, email info@realdemocracymovement.org with “October 28” in the subject line and we’ll get back to you. 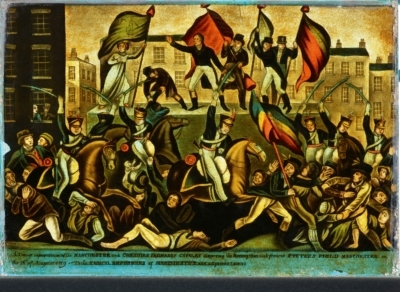 I understand that the watered down and muddy semantics -things like ‘economic model’ rather than ‘capitalism’ is used in order not to frighten the horses – whoever the horses might be – but it does risk seeming to be timid and apologetic for wanting to change things and as such it is difficult to be convinced of the acclaimed radical nature of the Labour proposals. The wishy-washy semantics also encourage the thought that this Labour New Deal will be nothing more that putting a more cuddly veneer on crony neo-liberal capitalism, similar to the programme of FDR in the US in the 1930’s. Welcome respite from the most egregious aspects of neo-liberalism, but hardly a different ‘economic model’ nor a different social or political one. For me this suspicion is heightened by a failure to address the core of the current rancid economic system; that of the financial system. Unless the Labour Party are willing to take the Bank of England back into the Treasury, under effective democratic control, and provide it with the role of issuing debt free money directly to the population – rather than bunging unlimited free cash (QE) to the criminal banking cartel to dish out to their mates in the City of London to play in the casino markets of speculative capital, as happens now – it is difficult to take seriously the notion of even the mild term: ‘different economic model’. Printing money could lead to hyper-inflation so I think we have to look for other solutions. Clearly a new banking, financial system is required, especially as the existing banks now generate large parts of their profits through trading and speculative activities. We’d have to rethink banking. At present, the assets banks hold are in the form of calls on other people’s assets – companies, houses, buildings, land etc. What kind of assets would a people’s bank hold? What would they lend against? The fact that we’re having to consider these questions shows how fragile the whole economic and financial system has become! Really important questions which give a sense of the scale of the challenge ahead. Obviously there are clear limits to nationalisation when we talk of transnational banks and finance services. However the government has a monopoly on money creation – even private banks cannot actually create money digitally except by using pound sterling, the currency it owns. It needs to use that as a bargaining chip and start to shape the argument towards more ethical principles as the basis for financial responsibility. It could also create a parallel national banking system e.g. regional banks and fund this through a quantitative easing programme. That in turn would incentivise private banks to match government money – not necessarily because they want to be good corporate citizens but because they know profits are secure if they follow government money.